It was great to take part in the latest Blue Prism Café, where we discussed our automation journey with a live audience – and this blog encapsulates those insights and final thoughts from that conversation. We both work for Ageas UK – one of the UK’s largest insurers covering 5 million customers for personal and commercial needs. We jointly possess over 18 years’ experience in robotics – gained from implementing projects that deliver excellence and efficiency through business process automation across Ageas UK. We’ll highlight the various elements that were critical to our successful deployment Blue Prism’s Robotic Process Automation (RPA) platform and provide best practice insights on how to ensure smooth change management at scale. Our automation journey started in 2009 as part of a continuous improvement initiative. The key driver was to initially enhance efficiencies across our sales and service operations, using a tool called Quick Test Pro. In 2014, we wanted to expand automation-type capabilities – covering manual process tasks across IT, HR, marketing and pricing. To achieve this goal, a more advanced, flexible and scalable RPA solution was required, so we approached a number of vendors. We created a ‘Dragons Den’ style selection process and because of our acquired automation experience, we asked searching, technical questions and performed meaningful evaluation tests. Blue Prism emerged the clear winner, as its RPA platform for ‘Digital Workers’ (software robots) proved the most user-friendly – being easy to understand and operate. We felt that this was important to ensure greater company-wide adoption. Blue Prism also provided strong security and governance capabilities – which were critical, as its Digital Workers were going to become part of our business processes – so these design features kept our IT team happy. Our automation program became centralized in our Bournemouth (UK) office where all the RPA tools are now housed. We also created aftercare and automation teams, which consist of people involved in automation development, analysis and management. Our team is positioned within Ageas UK as an internal ‘service provider’ to help business process owners across the company benefit from automation. To ensure successful outcomes, we have developed a clear automation implementation methodology. This activity starts with examining an automation idea request, conducting impact assessments, then developing and testing the Digital Worker. Further live testing takes place – while we ensure company stakeholders are effectively engaged in our activities. When we’re happy that everything is ready, the Digital Worker is scheduled for action – but receives ongoing performance monitoring, reporting and savings validation from our team. We’ve also evolved our approach to process development – so it’s structured into three categories; long term – with no required changes, shorter / mid-term, band-aid solutions to solve mid-term problems and instant fixes. To allow for any contingencies, we also ensure that our 30 Blue Prism Digital Workers always operate at 70 percent capacity – but always run 24×7. We have 52 live automations today using Blue Prism and other tools. One of our notable automations is claims information upload where Digital Workers process over 600 records daily – from multiple insurers. Other process automations include specialist household policy renewals, accounting refunds, insurer payments and upload of telematics scoring data from vehicle black boxes. The automation of these tasks has replaced manual labor – which has accelerated fulfillment – while reducing human errors and mitigating potential compliance risks. Since January this year, we’ve had over a million cases presented to automation and 95 percent of these have been successfully completed. We have generated 7312 hours per month back to the business – while avoiding the need to recruit 60 FTEs. One of the challenges most organisations face is gaining business buy in to automation, so we’ve worked hard to create interest and engagement in this area. Our approach is to actively keep the business involved in processes and highlighting that by supporting automation – helps remove the myth of human job removal. We also try to keep automation fun by humanizing our Digital Workers – we’ve even created their own bios and encourage the business to name them. We regularly post information regarding automation projects and relevant team events on our internal Facebook (Workplace) too. 1. Do you have any regrets to approach to implementation, or process selection – any major lessons learnt on your journey? None. The success of our RPA journey has resulted from being as agile as possible in our implementations. This means ensuring that governance is robust enough – but doesn’t bog us down and by not spending too much time focusing on detail – we’ve gained more benefits. 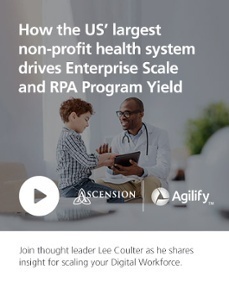 Blue Prism RPA is a great, easy to use tool, that doesn’t require coding skills – so operational people can be upskilled to use it. Finally, we’ve never been afraid of making mistakes. Experience comes from these mistakes and these learnings have strengthened our RPA journey. 2. How do you measure capacity and are there any human elements for capacity – e.g. automation team support to oversee robot processes which fall over? Assuming this question relates to the robot/Digital Worker capacity, we measure this based on a combination of volume and/or runtime – dependant on the automation. The programme provides the anticipated volumes and the aftercare team translate that into the required robot hours. We have 3 aftercare consultants – with an operating ratio of; 10 machines to 1 manager. 3. Are you using automation in your back-office functions? Like Finance? Our automation journey started in Back Office functions and Finance and many more automated processes have been performed since. We’ve now branched out to other business functions such as HR, Underwriting and Pricing. 4. What’s your average delivery time of automations from out of the idea board to running in production? Do you find this reduces as the team skill and library of objects increases? That really does depend on the size and complexity of the process. Our deliveries can take between 4 weeks and 3 months to get into production. The more complex the process the longer it takes. We run around 7-9 automation projects at once and it’s a constant cycle of projects in flight. Depending on the automation type, we reuse most objects – which can reduce the length of time to build automations. We’re now developing new objects for new automations, in different functions – outside of operations. 5. How do you find getting sign off on the business case for ‘band aid’ opportunities given these are for the short-medium term? We have a suite of robots that we use across all business processes and all functions, but don’t have robots set up for certain processes or functions. If we have capacity in the robots to automate the band aid process – we will. If we need more resource, we’ll build a case based on several of these changes vs. the cost of the robots required. As robots work quicker and more frequently than humans – the cost will always be less than paying people to do this work. 6. How do you link the RPA process automation into your end-to-end processing? All of our automation processes are mapped end to end and by key stroke mapping. When building requirements, all of the process is reviewed to ensure that all elements of the process are captured.